Now in its 3rd year The Art of Caring is needed more than ever to show support for Nurses, Carers, and the NHS. This is your chance to exhibit an artwork or haiku that demonstrates your passion for this theme, whether you have faced its challenges from the perspective of a carer or patient. 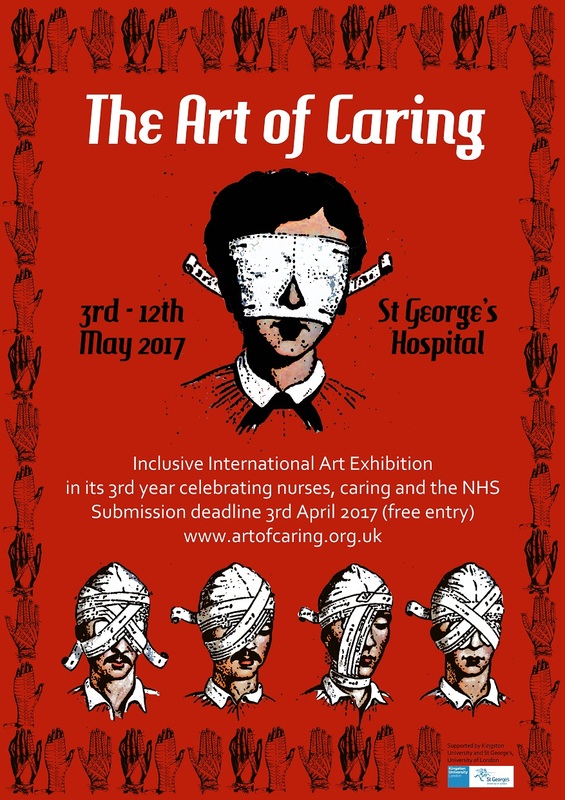 The first is at St George's Hospital (3rd-12th May 2017) where printed postcards of your artwork are displayed on the walls of the hospital to help celebrate International Nurses Day. This is an inclusive exhibition. The second is at St Pancras Hospital (July-October 2017) and uses a mixture of original artworks and printed postcards. Works will be selected by Arts Project curators Peter Herbert and Elaine Harper-Gay. The theme this year is Care, Caring and Sustainability. It is inspired by the theme for International Nurses Day 2017 which is Nursing: A voice to lead - Achieving the Sustainable Development Goals. You'll receive a confirmation email within 7 days with your catalogue/exhibition numbers. Before the exhibition we will print 2 postcards of each of your artworks. One copy will be sent to you and the other will be exhibited at St George's Hospital, Tooting, UK from the 3rd-12th May, 2017. This year we will be opening the exhibition on 3rd May 2017 alongside SNAP (Student Nurse Academic Partnership Conference) and finishing on International Nurses Day (12th May).